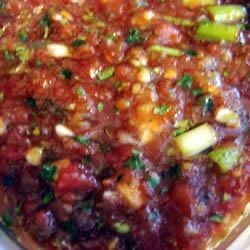 "This quick and easy salsa can be made in just a few minutes with a food processor. Green onions instead of white onions give it a nice, mellow flavor to balance the kick of the jalapenos. This recipe also works well with 2-3 habanero peppers instead of the jalapenos. But be sure to remove the seeds and membrane from the habaneros first! Grab a bag of tortilla chips, dip, eat, and enjoy!" Very good, but it wasn't spicy enough. I am going to leave the seeds in the jalapeno peppers and see what happens! I also used yellow onions instead of green. Very easy to make though!!!! This is good but added chopped white onions, since we love them so much. Used petite diced tomatoes. Used garlic from the jar. Omitted the oil. Quick and easy. We are salsa addicts. Fresh tasting! Made a lot. Added more lime juice.